Community activists opposing the Rudin family's proposed takeover of the St. Vincent's Hospital campus in Greenwich Village dropped their court appeal without ever appearing before a judge. 7.4 percent less than May 2010. However, excluding distressed sales, the year-over-year decline was just 0.4 percent. "Two consecutive months of month-over-month growth and continued relative strength in the non-distressed market segment are positive seasonal signs in the housing market. Rental property acquisitions in New York City tumbled 53 percent in May, after reaching a furious pace the prior month. Throughout the city, 29 buildings with a total of 1,078 apartments sold for a total of $144 million last month, compared with April, when 55 buildings with 2,193 units sold for a total of $308 million. Sales last month were also below May 2010, when 47 buildings traded for a total value of $199 million. The Securities and Exchange Commission is taking a closer look at real estate investment trusts that aren't traded on the stock exchange since David Lerner Associates was caught misleading investors, SEC officials. The four brothers that comprise the powerful, and secretive, Chetrit Group have split up into two separate firms. The firm, which recently bought Hotel Chelsea and has large stakes in 620 Sixth Avenue and 530 Fifth Avenue, have separated. The separation was not amicable. Brothers Joseph and Meyer Chetrit will continue business as the Chetrit Group, but have relinquished the firm's 404 Fifth Avenue headquarters to their brothers Jacob and Juda, who will operate as the Chetrit Organization. Joseph and Meyer will move into offices at 512 Seventh Avenue. The AFL-CIO plans to work with pension fund managers to ensure that at least $10 billion in union pension money is made available to fund infrastructure projects in the next five years. Richard Trumpka, president of the labor federation, is expected to announce the plan at a meeting of the Clinton Global Initiative in Chicago today. Union officials said they intend to work with Deutsche Bank and other financial institutions to come up with financing to retrofit large commercial buildings. Building owners are hesitant to do such retrofits themselves because they are already highly leveraged. U.S. subsidiary of Japan's Nomura Holdings is departing the World Financial center to take more than 900,000 square feet at Worldwide Plaza, George Comfort & Sons and RCG Longviews' 1.8-million-square foot office tower on Eighth Avenue and 50th Street that is now 95% leased. The move is expected in 2013. The steamfitters' union has inked a new contract with officials from the construction industry as the deadline for some two dozen labor agreements looms. The three-year deal approved by Enterprise Associates of Steamfitters' Local 368 was only the second new union contract to be agreed upon prior to Thursday's expiration of the industry's labor agreements, following a deal with the painters' union in the spring. Carpenters, concrete workers, mason tenders and brick layers have yet to reach an agreement, but operating engineers are the laborers expected to present the biggest hurdle. Ziel Feldman and One Madison Park Amalgamated Bank has acquired the senior piece of the One Madison Park condominium mortgage loan from iStar Financial, according to federal bankruptcy records, jeopardizing a rescue plan submitted earlier this month by HFZ Capital. 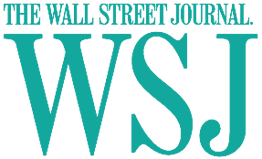 Manhattan-based Amalgamated already held the $78.5 million junior piece of the mortgage loan, and a New York state Supreme Court judge refused to block the deal despite a $75 million lawsuit from HFZ, a distressed real estate firm led by investor Ziel Feldman. HFZ asked the judge to block the deal on the grounds that Amalgamated, after initially promising to sell the junior piece to HFZ in November 2010, reneged on that deal and swooped in on the senior note after HFZ filed a rescue plan in U.S. Bankruptcy Court. 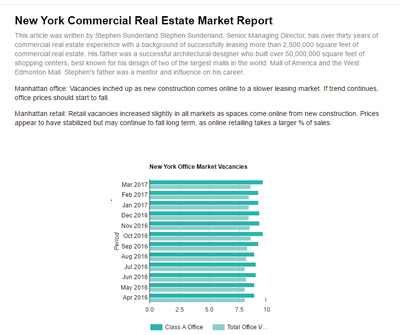 Manhattan is gearing up for a surge in new office construction mid-decade, according to recent analysis by the New York Building Congress, released yesterday. 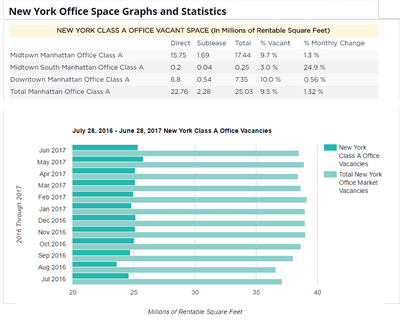 Manhattan added about 20 million square feet of new office space between 2001 and 2010, a modest offering by historical standards. Nearly 4 million square feet of new office space was created annually in the 1970s and 1980s. 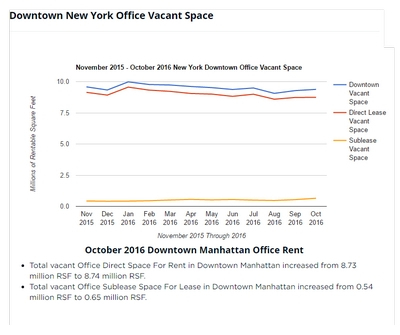 "It is remarkable how little office space was actually added in Manhattan during the recent building boom. Interiors of the World Financial Center The courtyard restaurants at the World Financial Center will disappear as part of Brookfield Office Properties' $250 million renovation project, leaving only P.J. Clarke's remaining. Brookfield president Dennis Friedrich confirmed that the company is "going to create a full second floor with double loaded corridors for stores" in their place. In fact, high-end fashion stores will populate the courtyard, a new adjoining glass pavilion and even the garden itself. On the Winter Garden's second level, stores such as Gap and Hallmark will be ousted to make room for a new dining terrace, similar to the Plaza's food hall. Rent Guidelines Board okays 3.75 percent hike for stabilized units The Rent Guidelines Board has approved a rent hike for rent-stabilized apartments in the city, affecting some 1.1 million apartments with a 3.75 percent increase for one-year renewals and 7.25 percent for two-year contracts,. The hikes will take effect October 1. " Gary Barnett's Extell Development has transferred its $375 million loan secured by the Belnord to mortgage servicer LNR Partners, which specializes in restructuring troubled debt. Now that Albany lawmakers have adjourned without doling out any additional funds to the still-incomplete Second Avenue Subway project, the Metropolitan Transportation Authority is asking residents living along the future transit line to help lobby for the money. According to the Post, MTA officials are worried about running out of funds by the end of the year, which would hold up their ability to move forward with three new stations at 72nd, 86th and 96th streets. Bidding for those contracts is supposed to begin within months, but William Goodrich, the senior vice president of capital construction at the MTA, said that "without additional funding, we won't have the ability to procure and award the remaining three contracts." 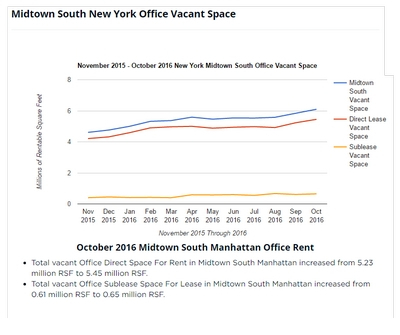 As the vacancy rate for Manhattan Class A office space continues to drop, landlords are trying to see how far they can push up asking rents. They are holding back on their most sought-after properties in order to achieve higher rents. The Class A vacancy rate dropped to 10.8 percent for June, down a full percentage point from the same period last year. Yet, the number of buildings with zero vacancies dropped -- from 48 to 42. 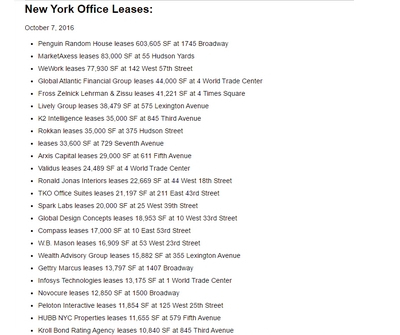 Only 23 Midtown office buildings are now fully occupied. Ten billion dollars worth of construction may grind to a halt this week if unionized crane-operating engineers decide to strike over wages and licensing exams. As the Thursday contract deadline approaches, contractors and developers who hire the engineers have been aggressively campaigning to eliminate "no-work" mechanics and oilers, who, they said, get compensated highly -- around $700,000 per year -- but do little graft. By eliminating the positions entirely, $67 million could be saved at the World Trade Center site over three years, they said. Managers and owners have also been urging the city to begin national licensing exams for operators to increase safety standards. Labor leaders, however, see the exam proposals as a means to leverage concessions from unions. Larry Gluck has struck a deal with Vornado Realty Trust to recapitalize his troubled Independence Plaza North apartment complex at 80 North Moore Street in Tribeca. Vornado purchased $185 million in junior debt on the 1,300-unit property for $185 million. Stellar Management originally bought the property in 2003, taking out $575 million in loans to renovate the apartments and convert them from middle-income housing to luxury rentals. 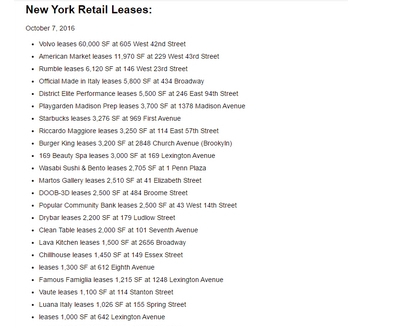 Ultimately, the revenue from those rentals didn't meet Gluck's expectations, and earlier this year, the loan entered special servicing. There's still some $400 million in debt that is maturing this fall. New residential developments are slowly turning a stretch of Hell's Kitchen from one of the largest patches of undeveloped land in Manhattan into a vibrant enclave. In the last three years, MiMA, a rental and condo building by Related on 42nd Street and 10th Avenue, Emerald Green, a 569-unit development on West 38th Street between Eighth and Ninth avenues and 455W37 and 505W37, TF Cornerstone projects on West 37th Street near 10th Avenue, have all come to the neighborhood. Construction is underway on more projects including a rental building by Glenwood Management at 330 West 39th Street. Anglo Irish Bank has defended itself against a lawsuit filed by New York-based Fir Tree Partners, which sought to force the bank to honor its debt obligation. The bank argued that its acquisition of Irish Nationwide Building Society and its sale of a U.S. loan portfolio were "non-commercial, sovereign acts" forced by the Irish government. Fir Tree owns $200 million of notes the bank issued in the U.S., and filed the suit because it doesn't want the bank to transfer any U.S. assets out of the country, for fear the debts won't be repaid. Heiress Huguette Clark's Fifth Avenue apartments now belong to her caretaker of 20 years, Hadassah Peri, and her goddaughter Wanda Styka, according to her long-awaited will, filed with the Surrogate's Court yesterday. ". More unexpectedly, her estate, valued at around $400 million, will transfer many of the old master works in the 907 Fifth Avenue apartment to her 24-acre Santa Barbara estate, Bellosguardo, which will be transformed into a museum. Chelsea Muse, 537 West 27th Street Leasing begins today at Chelsea Muse, the 28-unit building at 537 West 27th Street, The units range in size from 485 to 1,293 square feet, and are priced between $2,499 and $6,900 per month. A tentative deal to renew New York State's rent regulation laws and cap property taxes for homeowners emerged from Albany yesterday and is expected to move to the Senate and Assembly floors today for a vote,. The details of the so-called "framework" are as follows: much to the dismay of die-hard tenant-advocates, vacancy decontrol is staying, and landlords will still be allowed to deregulate apartments when tenants' monthly rent and annual household income reaches certain thresholds. But those thresholds are being increased to $2,500 from $2,000, and to $200,000 from $175,000, respectively. Landlords will also be held accountable by state housing officials for how much they spend to upgrade rent-stabilized apartments before they're allowed to charge tenants for building improvements. The developer that purchased the 40,000-square-foot vacant lot at 33-44 Putnam Avenue in Clinton Hill for $2.345 million last month isn't about to waste any time on the investment. Construction has already begun at the site, between Downing Street and Irving Place, where permits filed with the Department of Buildings show that a 75-foot-tall, Karl Fischer-designed residential project is on deck. Sources say that the New Jersey-based developer is planning to fill the seven-story building with 30 affordable housing units. City Planning Commissioner Amanda Burden has announced a rezoning proposal for 181 blocks in the Williams Bridge and Baychester neighborhoods in the north Bronx to encourage development and still protect lower density blocks from out-of-character buildings. The proposed area is bound by the Bronx River and Shoelace Park to the west, the New England Thruway to the east, 233rd Street to the north and East Gun Hill Road, Lurting Avenue, Givan Avenue, and Hammersley Avenue to the south. The rezoning, City Planning said, would "channel moderate new growth opportunities to wide corridors with better access to transit that can accommodate future growth, including White Plains Road and East Gun Hill Road." Neighbors of 31 West 15th Street have long been lobbying against the construction of a new residential tower at the site, but new zoning documents finally reveal the extent of what they're going to be dealing with. Developer Alchemy Construction is planning a 25-story, 335-foot-tall residential tower there, thanks to the air rights it acquired from the neighboring Xavier High School. Xavier is slated to take the first through sixth floors of the new building, of which the design has yet to be unveiled because the project hasn't been officially approved by the city. Alchemy's original proposal was rejected by the city in March, but the building's zoning plans were approved earlier this month, and demolition of the current structure has already begun. The city's School Construction Authority has tapped Dattner Architects to design the Riverside Center School (P.S./I.S. 342), the new public school at Extell Development's massive Upper West Side development site. An announcement from Dattner provides more details about the upcoming "green" pre-K-through-8th grade-school, which will contain more than 20 classrooms as well as art and music rooms, a science suite, library, gym and cafeteria. It will be housed on the first four floors of Atelier Christian de Portzamparc and SLCE's planned high-rise tower on West End Avenue, between 60th and 61st streets, and is slated for completion in time for the 2015-2016 school year. The developer of the Aqueduct casino in South Ozone Park, Queens is considering building a convention center to rival the Javits Center., Gaming company betting New York, which operates Resorts World Casino at Aqueduct, has proposed building on the land surrounding the casino once the first facility is complete. (The project is slated to wrap up this year.) The limited space in Javits, which is undergoing renovations and just added a new wing with another 80,000 square feet of exhibition space last year, has long been the source of complaints from the business and tourism industries. Gary Barnett's Extell Development Company has defaulted on a $375 million building loan for the Upper West Side's 213-unit Belnord rental building,. The loan on the building, at 225 West 86th Street, between Broadway and Amsterdam, is now 30 days delinquent. The Belnord ran into difficulties when a New York State Supreme Court ruled that it was not permitted to increase rents on rent-controlled or rent-stabilized units because the property had received a J-51 tax abatement from the city. Manhattan hotelier Shimmie Horn,will make lots of money if the city opts to turn four warehouses purchased by Horn into city shelters. If the arrangement is cemented, the Department of Homeless Services would pay $6 million each year to non-profit organizations to operate rehabilitation centers, and in return, providers would pay out rental checks worth millions to providers such as Horn's management company. Horn would most likely supply four shelters. He bought the properties, in Greenpoint, Ocean Hill and East New York, recently for $12 million. Chinese residents flush with cash from the Asian nation's booming economy, and in some cases limited in what they can buy at home, are starting to look at Manhattan apartments. Between March 2010 and March 2011, 9 percent of foreign buyers in the U.S. were from China, according to the National Association of Realtors, up from 5 percent in 2007. Canada sends the U.S. the most foreign buyers, with 23 percent, but China is number two, the data shows. In contrast, England, Mexico and India, next on the list, each represent 7 percent..
Savanna Partners is has made half-dozen debt acquisitions in the past 12 months, and plans for several more by the end of 2011. Other CIM Group, or HFZ, few companies have made multiple investments and in the office market., Savanna is putting itself forward as a firm ready, willing and able to make deals happen, often before anyone else sees them coming. Brooklyn still lags far behind Manhattan in the number of big national retailers. 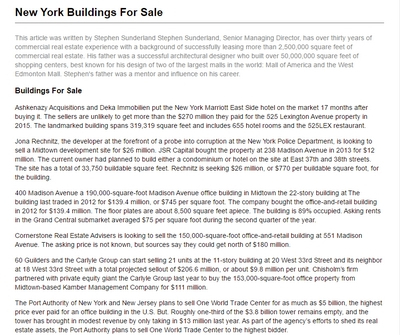 That was a major discussion point at the 2011 Brooklyn Real Estate. Downtown Brooklyn, as crucial to landing those retailers. "Brooklyn is too spread out to achieve national retailers in every business district in the borough," said Michael Phillips, managing director at real estate investor Jamestown, which has stakes in Be@Schermerhorn in Downtown Brooklyn and four Manhattan buildings. But, by trumpeting Downtown Brooklyn, where retail traffic is already evident, Brooklyn can lure the big-box national retailer willing to be a pioneer. HFZ Capital's Ziel Feldman, Green Bridge's Cevdet Caner and One Madison Park A long-awaited reorganization plan was submitted in the One Madison Park bankruptcy case late yesterday evening giving an outline that could finally lead to the troubled condominium settling millions of dollars in claims and resuming sales. The plan, submitted to the U.S. Bankruptcy Court in Delaware, calls for senior lender iStar Financial to get $162 million in the form of a secured note. In addition, $12.5 million in mechanics liens would be recovered in the form of cash, $15 million to $20 million in "unclassified claims" would be recovered in immediate cash, deferred cash and other payments and another $160 million to $180 million in unsecured claims would be recovered at the rate of 3 to 5 percent. The estate of Lehman Brothers Holdings has taken control of the 169,664-square-foot On the Ave Hotel at 2170-2178 Broadway at 77th Street for $191 million, a spokesperson for the estate confirmed. "The strategy of the estate has been to maximize the value of its properties -- not to fire sale them," she said., Lehman has been involved with the property for at least a decade, having had a $31.7 million mortgage in 1997 with a previous owner.. The sale may have been a deed in lieu of foreclosure. The hospital's new Center for Science and Medicine shows up older neighbors:. The hospital, which currently occupies a superblock stretching from 98th to 102nd streets between Fifth and Madison avenues, has three simultaneous projects in the works. These include two striking, brand-new buildings that are eventful for the neighborhood: Mount Sinai's new Center for Science and Medicine, a research building, and a 43-story residential tower at 4 East 102nd Street. Together with the third project -- a 16-story prewar rental building at 1212 Fifth Avenue that's being converted into condos -- the changes considerably improve the quality of the area's building stock. Barclays and the estate of Lehman Brothers Holdings are in a dispute over how to unwind real estate investment trust Archstone, a $22 billion investment made at the peak of the commercial real estate boom that contributed to Lehman's downfall. Barclays is pushing to sell the company or its assets privately whereas Lehman favors a longer-term approach: taking the company public in what would be the largest real estate. Meanwhile, Bank of America, the third and final partner, has yet to decide on a favored strategy. It has, however, voiced worry about how much value an IPO would create; Analysts predict between $4 billion and $6 billion in equity. Midtown-based property owner Joe Tabak is battling in court over a disputed contract to buy a share in the neglected Ring family's Manhattan real estate fortune for $112.4 million. Tabak, through his Princeton Holdings, signed an agreement Feb. 24 with Michael Ring, a co-owner of the properties, to pay $112.4 million in debt and equity for a partial interest in 14 buildings, mostly in Midtown South near the Flatiron building, a lawsuit filed May 31 in New York State Supreme Court shows. By April 15, Tabak had put about $10 million in escrow, and confirmed in writing that he wanted to proceed with the transaction. But Ring backed out of the deal, the lawsuit contends. Now, Tabak wants the complicated joint venture deal -- made up of five different parties -- to go forward, and in his petition, asked the court to order arbitration and issue a temporary restraining order blocking any sale of the properties. On June 6, the judge agreed to the temporary restraining order. 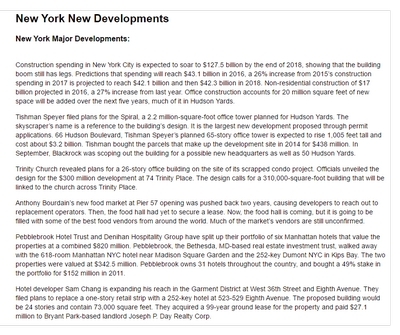 The top Harlem condominium developments command more than $715 per square foot in closed sales since June 2010,. 2280 Frederick Douglass Boulevard, called 2280 FDB, ranked first in the entire neighborhood with an average closing price of $736 per square foot. The 12-story, 89-unit condo between 122nd and 123rd streets was developed by Harlem-based RGS Holdings. Twenty-eight units in the building sold during the 18-month time frame ending this month, and 56 have sold overall. The homes range from 455-square-foot studios to 1,625-square-foot three-bedroom apartments. The Obama administration has set the stage for the development of new casinos by abolishing a Bush-era directive that said Indian tribes could develop casinos off their reservations only if they were within commuting distance. Instead, the administration is reverting back to a policy that considers off-reservation casinos on a case-by-case basis. The shift in policy is likely to breathe life back into a number of off-reservation projects around the country, including in New York's Catskill Mountains. Tribes interested in developing casinos in the Catskills include the St. Regis Mohawks, who at one point were looking at a site attached to a racetrack in Monticello, N.Y., 350 miles away from its reservation. The Wisconsin-based Stockbridge-Munsee tribe has also sought to build a casino in the Catskills. A new luxury West Chelsea rental project from billionaire Sam Zell is being closely watched as an indicator of where new development is headed in the near future. Already, the project at 500 West 23rd Street has been a focal point for union protests. Certainly, with 23 union contracts set to expire this month in New York, the kerfuffle is indicative of the deteriorating relationship between big developers and organized labor in the city. Still, the developers have high hopes for the High Line-adjacent building, as the rental market recovers in one of the city's busiest areas for new development. City Council Speaker Christine Quinn is attempting to block the July opening of a 328-bed homeless shelter in Chelsea. The 12-story facility at 127 West 25th Street was built primarily to house 200 New Yorkers with a history of mental illness, while also providing space for a reception center and for victims of substance abuse. But Quinn penned letters to Mayor Michael Bloomberg and the New York State Commissioner of Temporary and Disability Assistance, Elizabeth Berlin, saying the shelter, named the Bowery Residents Committee, does not comply with local zoning laws. Goldman Sachs' Whitehall real estate fund lost substantial money on Monday Properties' recent $750 million recapitalization of 230 Park Avenue. Goldman is abandoning its stake in the building following the transaction, with the building's valuation hundreds of millions of dollars less than what it was bought for at the height of the bubble. Goldman partnered with Monday Properties on the $1.15 billion purchase of the 34-story office tower near Grand Central Terminal in 2007, and admitted at the end of 2010 that the property's value had sunk some $300 million. The last three years may have brought Manhattan apartment prices down, but actually moving in New York City is getting more and more expensive. Faced with skyrocketing operating costs, but also under pressure to keep monthly owners' charges low -- and reserve funds high -- condo and co-op boards are feeling the pinch. That means zeroing in on easy revenue-boosters, many of which are charges imposed on new buyers and renters. Often totaling several thousands of dollars, these costs come in the form of application review fees, administrative fees, move-in fees and various other add-ons from managing agents and boards. These fees, which have been on the rise in many co-ops and condos since the downturn, are usually just an annoyance for buyers, but for potential renters, they can be a deal-breaker. MetLife has grabbed a 2 percent share of New York's residential mortgage market just as rock-bottom lending rates and rising consumer confidence begin to spur home sales. The nation's largest life insurer, with $55.9 billion in revenues, is planning a measured approach to growth in its hometown. "As a new lender, we don't have the baggage of the past.. Most of its volume comes from financing sales at dozens of new condo developments where the bank acts as the projects' preferred lender, such as Extell Development's the Aldyn and the Rushmore. Trinity Church Real Estate has signed a 99-year lease with an affiliate of Beacon Capital Partners for an entire office building at the stalled development site at 330 Hudson Street, between Charlton and Vandam streets. Last month, Beacon signed on to buy 70 to 80 percent of 195 Broadway from L&L Holding and GE Pension Trust.. A nearly year-long legal battle between Trinity and Tribeca Associates ended last year with Trinity taking back the lease on the site. Trinity granted Tribeca a 99-year lease on the space four years ago, but a construction stall led to threats of foreclosure from Trinity, which said that the developer wasn't living up to lease agreement stipulations. Borders will likely close 51 locations, including those at JFK airport and Penn Station, by June 22 to avoid defaulting on its bankruptcy loan. Borders hasn't been able to negotiate extensions from landlords at those locations on deadlines to assume or reject the leases. Borders' creditors, led by GE Capital, said they would not allow the bookstore chain to assume the leases itself. In the meantime, Borders will seek permission to sell furniture and equipment from those stores through a liquidator, while asking lenders to grant a grace period until July 21, when Borders goes to court to potentially close on the sale of the entire business. Nearly a month after Condé Nast formally agreed to lease about 1 million square feet in 1 World Trade Center, brokerage firms are mulling over what impact the publisher's move from Midtown will have on the Downtown market. The Fire Department of New York is building an Emergency Medical Service facility to serve the Williamsburg and Greenpoint neighborhoods.. Construction is underway at the 332 Metropolitan Avenue site near Roebling Street, and the building is slated to open in August 2012. 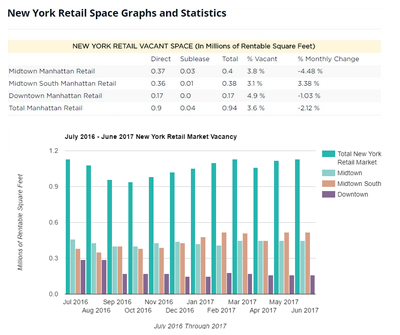 The Manhattan rental market has now fully recovered to pre-downturn levels.. Just 0.69 percent of Manhattan rental units were vacant in May, the lowest level in five years. And that's not due to lower prices. Thanks to year-over-year price gains of 8 to 10 percent across all unit sizes, the average Manhattan monthly rent jumped to $3,353, just 1.2 percent less than the 2007 peak. The Manhattan rental market is nearing the conditions seen at the market's peak.. The city obtained court permission to build a marine waste-transfer station off the East River and East 91st Street without legislative approval. The city had been angling to construct the station as part of a solid-waste management plan that would contain some of Manhattan's waste on site to prepare it for export. Nearby residents, led by former Assembly member Adam Clayton Powell IV, sued in 2006 claiming that the city needed legislative approval because of the proposal's interference with the Asphalt Green and Bobby Wagner Walk, a stretch of promenade along the East River. But by ruling that the two spaces are not public parks, and thereby not subject to the Public Trust Doctrine, the court prevented the city from needing approval. As the CEO of the Gristedes supermarket chain John Catsimatidis ushers his "Ocean Dreams" proposal for the west end of the Coney Island boardwalk through public review, it's becoming increasingly likely that he'll market the development to middle-aged adults and seniors. Brooklyn Borough President Marty Markowitz said the development, which calls for three towers ranging from 14 to 22 stories, would be most successful if it attracted residents over the age of 55. Attorney General Eric Schneiderman has begun to issue subpoenas in an investigation into the collapse of the Sorrento New York, a 43-story luxury condominium tower where a group of Irish investors allege their deposit funds were misappropriated by the developers. The probe centers on whether developers, which include Esplanade Capital's Jay Eisenstadt, and brothers Kevin and Donal O'Sullivan of Time Square Construction and Navillus Contracting, respectively, improperly co-mingled $17.1 million of deposit funds with operating money at the tower, which is at 306 West 48th Street, before a bulk purchase deal with Ireland-based Sorrento Asset Management, fell apart in 2009, according to sources familiar with the case. Seattle-based Sabey Data Center Properties has purchased a controlling interest in the former Verizon Tower at 375 Pearl Street for $120 million. The 32-story processing center, had once been slated to undergo an office conversion under Taconic Investment Partners, which bought the property from Verizon for $173 million in 2007. Those conversion plans never materialized, as Taconic wound up defaulting on its mortgage payments, and M&T Bank took control of the mostly-empty building last year. Sabey has no intention of reviving the offices idea, instead opting to transform the 29 floors it's taking over into a data processing center that can handle 40 megawatts of power -- enough for 40,000 homes -- by 2012. From the 2011 Data Book: Westchester, dominated by single family homes, saw that segment rise in price nearly 16 percent in 2010. But like positive numbers in Fairfield and Northern New Jersey, it was more a sign of stabilization following an extremely weak 2009. The jump in Westchester single family home prices also reflected a shift in the mix of homes sold from the prior year. Ziel Feldman's Manhattan-based HFZ Capital Group is setting its sights beyond Manhattan island, as it has tapped Jacqueline Finkelstein to head a team focused on purchasing performing, non-performing notes and fee positions across the country. Finkelstein had previously worked for the Moinian Group, but left the firm to pursue some real estate opportunities of her own. Now that most of them have wrapped up, she said she is focused solely on her new role with HFZ Capital, which she started about two months ago. Tribeca Associates is on the verge of acquiring the Class B building at 170 Broadway from AMG Realty and transforming it into a hotel. It's one of several hotel projects in the works Downtown, which said the area is experiencing a 20 percent increase in hotel rooms thanks in part to the Sept. 11 memorial opening this fall. Other developers have already started construction to bring hotels to 24 John Street, 32 Pearl Street, 53 Ann Street and 87 Chambers Street. In the first quarter of 2011, the delinquency rate for loans held in commercial mortgage-backed securities reached the highest level since Mortgage Bankers Association began tracking figures in 1997, but the climb was slower than in recent quarters. Delinquency rates among different commercial, multifamily mortgage investor groups were mixed for the quarter and rates for other groups remain below levels seen in the last major real estate downturn during the early 1990s -- some by large margins. Development firm Gotham Organization has secured a $530 million construction loan from a group led by Wells Fargo for a residential complex on the Far West Side. The development, called Gotham West, will consist of four buildings and about 1,240 residential units taking up almost a whole block between 44th and West 45th streets and 10th and 11th avenues. Construction is slated to commence in the third quarter of this year. More than 500 of the units have been designated as affordable housing. 400 Park Avenue is bringing in Connecticut-based Fieldpoint Private Bank & Trust into 11,000 of its 270,000 square feet, just as longtime discount retail tenant Syms prepares to vacate its 70,000 square feet this fall. Waterman Interests, which acquired the building for $35 million last year, is pushing to rebrand the address in an effort to attract the sort of tenants that occupy nearby buildings. Waterman hopes to lease Syms' seven-story space to a single firm. Goldman Sachs plans to fight back suspicions that it wrongfully profited from the housing crash by releasing documents showcasing its mortgage bets on its website. The Senate subcommittee's investigation into the firm is fueling speculation that the firm profited from shorting the housing market while many of its clients' funds were tied to the success of the market. The Senate panel released charts showing that Goldman had as much as $13.9 billion positioned against the market, but the firm claims the subcommittee neglected more than $5 billion of mortgage-backed loans held by the firm at the time. Despite a dramatic drop in the number of foreclosures in Queens compared to 2009, 1,404 properties were foreclosed on in 2010, more than the number of such homes combined in the city's four remaining boroughs . Moreover, all but two of the zip codes among the top 15 in foreclosure in New York City were in Brooklyn and Queens. But citywide foreclosures declined in each quarter in 2010, capped off by just 487 foreclosures in the fourth quarter, a 26 percent drop from the 659 filed in the previous three months.. The Bloomberg administration is ramping up its opposition to a GOP-sponsored Senate bill that would cap property taxes for apartment building owners whose tax abatements are about to expire, calling it "a large tax break dressed up as housing policy,". The legislation, introduced by Senate Housing Committee Chair Catharine Young, would extend the now-expired 421-a tax abatement program for four years, while imposing a 30-year cap on property taxes for landlords whose abatements are expiring and who agree to keep 20 percent of their housing units affordable. In those cases, property taxes would be capped at 20 percent of the buildings' rental income, and according to Bloomberg administration officials, the city would lose an estimated $2 billion in revenue as a result. 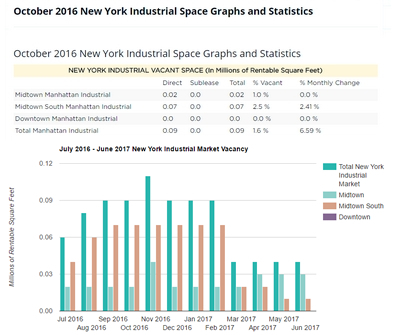 Property values for Midtown Manhattan office buildings are nearing their 2007 peak and are poised to eclipse it within the next 12 months. 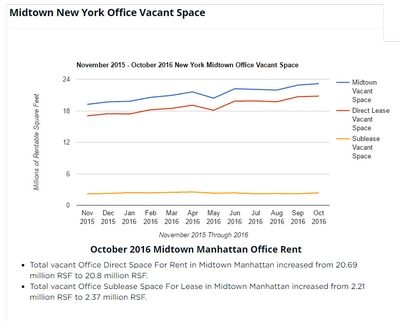 Office properties in Midtown have recovered 88 percent of the value lost since 2008 and are now within 15 percent of their peak, thanks to demand from investors who expect rents to rise. Lower Manhattan hasn't fared as well, recovering only 41 percent of the value lost since the bottom of the market there in 2009. 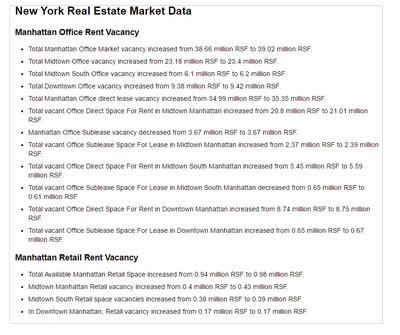 Overall, Manhattan offices have bounced back by around 78 percent, , and are now even with their levels from mid-to-late-2006. Whole Foods has won the support of a Community Board 6 panel for its planned Gowanus Canal superstore, despite calls from locals for it to downsize. The proposal for a 56,000-square-foot store, 20,000-square-foot greenhouse and 250-space parking lot at Third Avenue and 3rd Street, is already scaled back from a previous, 68,000-square-foot plan that included 420 parking spaces. Nonetheless, the company still needs a zoning variance in order to build more than 10,000 square feet there. The proposal has already been delayed once for environmental cleanup after the company found toxins at the site. Allen Rosenberg, 120 East 32nd Street, Indigo Condominium at 125 West 21st Street, 289 10th Avenue and Allegria Hotel & Spa in Long Beach. Now, he is under pressure from lenders who are selling the notes on three of his Manhattan retail properties with a face value of $11.5 million, as well as the $2.7 million loan on a 35,000-square-foot shopping center in Commack, L.I. In addition, $30 million in loans on the luxury Allegria Hotel & Spa in Long Beach, L.I. is being sold, according to sources. Alrose did not respond to requests for comment. New York's building contractors have voted to end a more than century-old pact to use only union labor on construction sites as a June 30 deadline nears for building trades contract negotiations in the city., Louis Coletti, president of the Building Trades Employers' Association, said yesterday that his board of governors voted to end the New York Plan for the Resolution of Jurisdictional Disputes, which is set to expire Dec. 31 but has always been extended in the past. The long-time agreement, with the Building and Construction Trades Council, requires contractors to hire only union workers and helps to resolve disputes between unions so that work is never interrupted during projects. Billionaire investor Ronald Burkle is making his first official foray into the New York City boutique hotel scene with a stake in the upcoming NoMad Hotel. The 168-room project, on the corner of Broadway and 28th Street, is scheduled to open during the first quarter of 2012 after several years of delays, with room rates starting at around $400 per night. Burkle, whose Yucaipa Cos. already owns a 30 percent stake in Morgans Hotel Group, made his investment through a new venture with Sydell Group, the hotel developer and operator that owns the 124-year ground lease for the site and that is also a part-owner of the Ace Hotel one block away. Wal-Mart is opening its first-ever Wal-Mart Express next week in a small city in Arkansas, part of a new format of small stores that could ultimately help the retailer break into the New York City market., Wal-Mart is aiming its Express chain -- whose branches will contain around 15,000 square feet -- at rural and urban areas where grocery stores are relatively scarce. After opening the prototype in Gentry, two more Express stores will open in Chicago this summer, followed by another dozen nationwide by the end of the year. If the Chicago market proves to be a success, New York City could be next, a Wal-Mart. The cost of City Hall's renovation has soared to $119 million, or nearly twice the original budget for the project. Workers installing sprinklers in the building have uncovered new and "alarming" water damage to the ceilings, among other needed fixes, sending costs through the building's decaying roof. That roof was, in fact, the original, 2009 impetus for a $65 million renovation plan, after a ten-foot section of the ceiling in a second-floor committee room collapsed. Workers have since been reinforcing, painting and re-plastering the roof of the Council Chamber and replacing the stars and rosettes that had sustained damage.. The North Park Apartments, a 123-unit Section 8 affordable housing complex on the Upper West Side, will remain affordable for at least the next 30 years thanks to a $36 million financing award from the city for the Related Companies to use towards renovations. Related last gut-renovated the five-story complex at 20 West 102nd Street in 1983, when it was converted into an affordable housing project. Now fully occupied, the building will get new bathrooms, fixtures and floors, as well as improvements to the mechanical systems. Proceeds raised from the $27.8 million in tax-exempt bonds and $8.1 million in recycled tax-exempt bonds will translate into roughly $55,000 worth of upgrades per unit, according to the city's Housing Development Corp.
New York-based Blackstone Group will borrow up to $1.35 billion to refinance the debt on a portfolio of office buildings largely comprised of California properties. Blackstone acquired most of the properties through its purchases of CarrAmerica Realty and Trizec Properties in 2006. MetLife and New York Life Insurance will underwrite senior mortgages worth $850 million, while the Government of Singapore Investment Corp. will provide a mezzanine loan to cover the rest. The lease for the 1 million-square-foot Hunts Point Terminal Produce Cooperative Market expired yesterday, and its vendors have reached a tentative deal with the city to stay in the South Bronx for three more years while the two sides hammer out a more long-term arrangement. Per the terms of the deal, the co-op will negotiate exclusively with the city for the next nine months over the construction of a new facility and a long-term lease. New York's Fifth Avenue remains the world's most expensive retail destination as retailers continue to focus on major fashion capitals,. Rental values for the strip, extending from 49th to 59th streets, reached $2,100 per square foot, marking an increase of more than 10 percent in the last 12 months..
Hilton is looking at several locations in Manhattan where it would open its first Homewood Suites hotel, which is part of its extended-stay concept,. Office and industrial loan delinquency rates are continuing to worsen as figures improve for all other major property types,. The U.S. commercial mortgage-backed security delinquency rate fell slightly in May with the percentage of loans 30 or more days delinquent, in foreclosure or real-estate owned declining 5 basis points to 9.6 percent. Although relatively small, the decline is actually the biggest rate drop for commercial real estate loans in CMBS in two years. "Last month, the delinquency rate posted its biggest rate of increase since late 2010 -- a 23 basis point jump," "The increase took many CMBS pros by surprise as it came after three consecutive months of improving results." Switzerland's largest lender, UBS AG, is in talks to move its Stamford, Conn.-based U.S. investment bank to Larry Silverstein's planned 3 World Trade Center tower by 2015. The bank, which currently has New York City offices at 299 Park Avenue and 1285 Sixth Avenue, would take around 800,000 square feet at the 71-story, 2.1 million-square-foot skyscraper, which will have an alternate address of 175 Greenwich Street and is one of four that Silverstein is planning for the site. UBS completed the move to its Stamford facility, which houses the world's largest trading floor, in 2002.